We splash cold water on our early morning faces before heading to Baltimore’s Penn Station in the dark where I drop my wife to catch the 5:50AM MARC (Maryland Area Regional Commuter) train departing Baltimore Penn Station for Washington Union, where she will then transfer to the DC METRO and arrive at her work site by 7:30. Based on time and cost, this is a better choice than driving through AM and PM rush hours in two cities, which she has also experimented. I work in Baltimore, but have meetings in DC’s Maryland suburbs. Right now, we are a couple straddling the Baltimore/ Washington region. We are not alone. 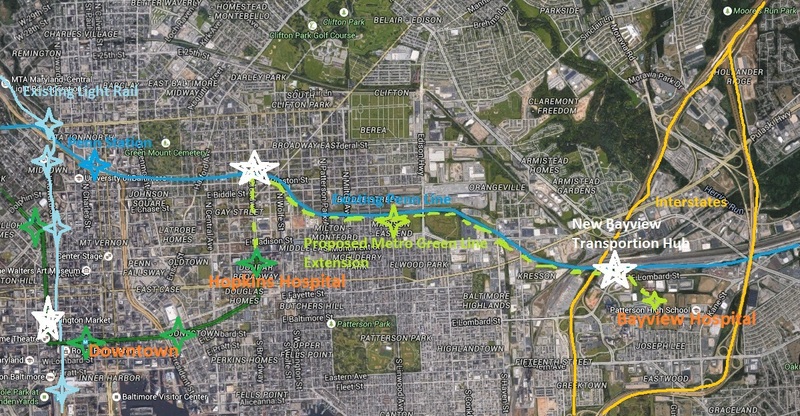 The status quo development (above image) between the cities is comprised of both corporate and residential sprawl a few miles from MARC stations, but useless to arriving train passengers. The US Green Building Council (USGBC) and its LEED rating system need to play a role. USGBC should not be giving isolated land gobbling sprawl producers green credentials for energy efficiency when these same buildings require inefficient commuting. 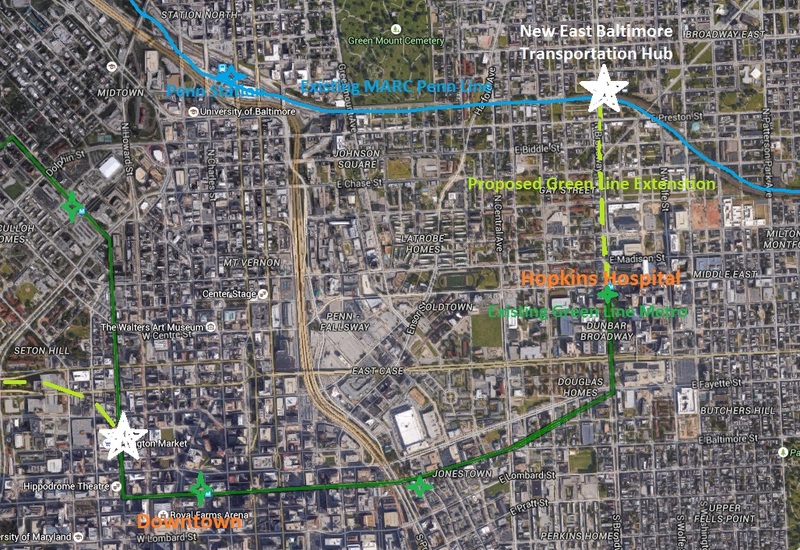 What is surprising is there is nary a sprout of an urban cosmopolitan edge city that is oriented around a MARC train station between Penn and Union Stations. Arlington, Rockville, Bethesda, and Silver Spring are small cities that have grown up around Washington Metro Stations. Kaid Benfield has covered the Arlington success story and Chris Leinberger has described the growth of what he calls “walk up” development that is becoming so prevalent in the Washington Metro Area. By contrast, all seven MARC Penn Line stations between Penn and Union or “stations in the middle” (SIM), lie in a desert of surface parking lots (there is a garage at BWI). It is difficult to even get a cup of coffee at most of these outposts. What is also important to note, that MARC trains can deliver a passenger from these SIMs to the center of Washington (and Baltimore) roughly as fast and more comfortably as the Washington Metro (or car) from the aforementioned edge cities’s metro stations. 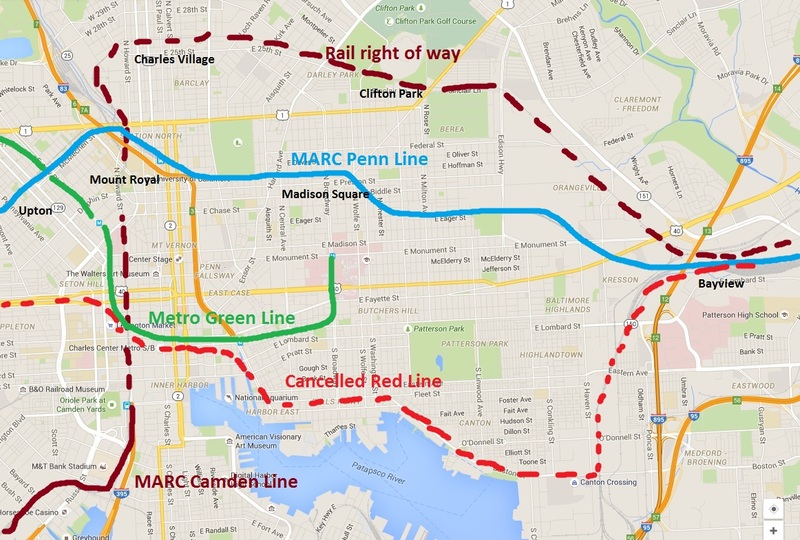 Image: Lots of urban development opportunity at the underdeveloped MARC stations between Baltimore and Washington. Bowie State University and BWI stations shown. While this author advocates for infill development inside the beltways, he acknowledges the demand for development in between. 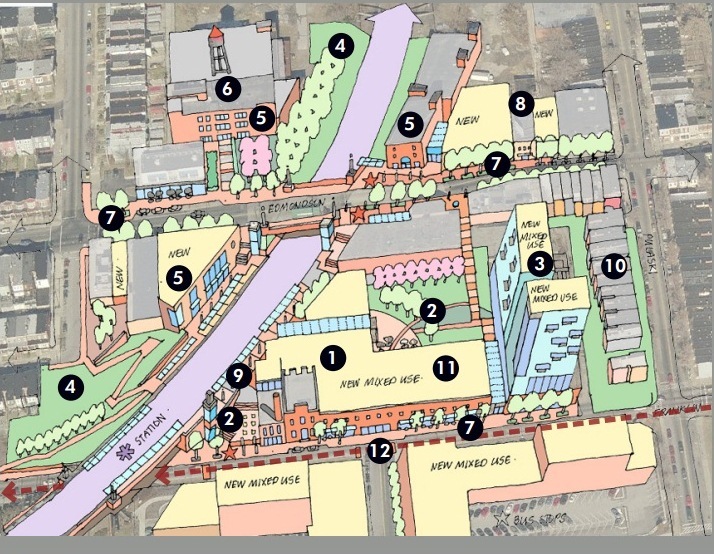 It is time to start urban mixed-use development along the MARC Penn and Camden Lines. MDOT proclaims they are open for business partnerships and have a transit-oriented-development (TOD) underway at Odenton. Private sector developers have made lots of money building urban product at Washington Metro Stations, particularly in Montgomery and Fairfax counties. There is potential for similar opportunity adjacent to MARC stations. So why has scattered growth continued between the two cities while MARC stations remain the nucleus of constellations of barren commercial-less surface parking? I speculate the issue is structured parking. With cheap available green fields, why build the more expensive structured parking for more urban development patterns? The reason for change is this. 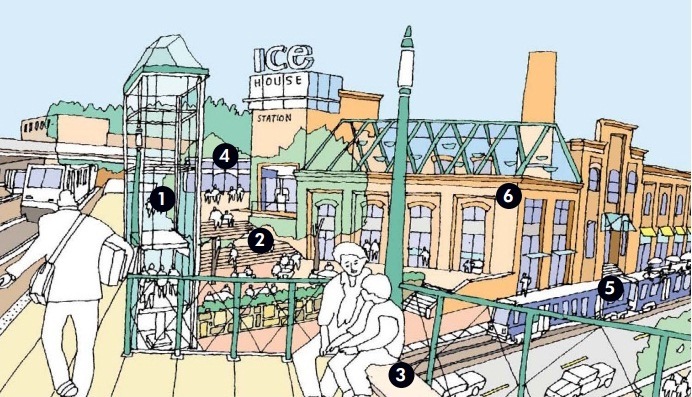 There are an increasingly large number of consumers and employees who operate between Baltimore and Washington that prefer a hassle free train ride complemented by a short walk to an office, a restaurant, a hotel, or a residence on both ends, especially in a cosmopolitan urban environment. There is a premium for this in Bethesda and Arlington, and there will be at MARC stations. To get on a roll at MARC stations, the public sector may have to help build and finance structured parking to open land adjacent to stations for development. Stu Sirota, Principal of TND Planning Group, says there needs to be an overarching vision coupled with marketing. 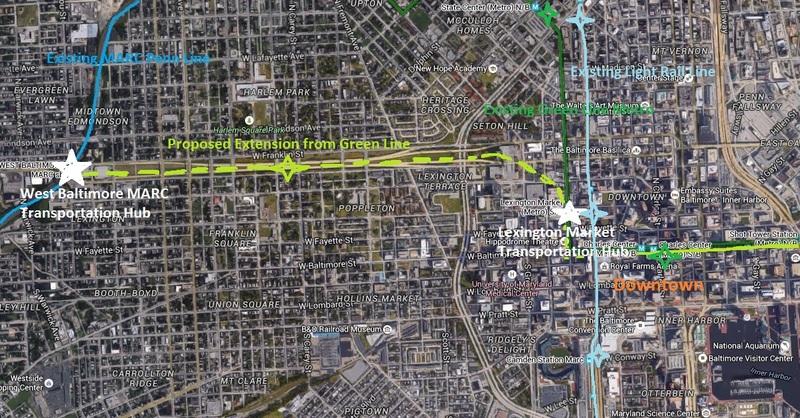 Stu continues – “A real regional planning effort or charrette will show how all these station areas could become cool transit villages (or bigger) and what an incredible impact that could have on the Baltimore-Washington corridor.” Once there are a few hot spots along the line, the SIMs will be coveted real estate. It is time to get started.